ISBN 9790006536405. 30 x 23 cm inches. Text Language: English. Illustrations: Charlotte Panowsky. Original German title: Fruher Anfang auf der Geige - Band 1; Eine Violinschule fur Kinder ab 4 Jahren. Note reading is introduced from the beginning, and accidentals are explained in the easiest way in the first volume. By the end of the first book, many English children's songs using all fingers have been played and note values from more...whole to eighth notes have been introduced. Even the easiest exercises are underlaid with text so that melodies can be perceived as a whole. Includes pull-out sheet with flashcards that can be cut out. with my students.The duets from book 3 & 4 gives them a strong ensemble playing ability.I have gone through the teaching methods of Prof. Sassmannshaus in detail and I am so happy to see his new techniques in single finger scale playing and variety of bowing techniques which can all be seen from his web site.Very easily position playing is achieved in a short time! 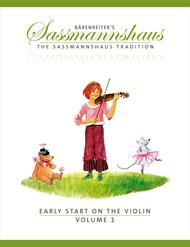 I have been teaching, performing and composing for the past 30 years and I can definitely say this is the best system and these are the best books you can depend on for your younger generation of Violinists. them master each new concept without weeks of work on one song. Note reading is immediate, and again, well reinforced by repetition. The book is designed for kids, with bright colors and text and notes in their size. I also appreciate this book introduces the use of all four fingers very early on. In looking ahead, I am excited to work with my students on positions early as well. Just appreciate an innovative approach that engages my students and supports me as a teacher. methods. Somewhere near halfway and the end of Book 1 (depending on the child) I start Suzuki Bk 1. That too, is a breeze. Out of curiosity I have used it with slightly older kids (10) but they do tend to feel that a few of the things are a little too easy for them. Not necessarily true but that's OK- we use it as an exercise or skip it and move on. I explain that some of the book is written with a younger child in mind and we don't have to do everything. There is plenty of variety offered for any given skill. I love the method for young students and it's solid approach to technique and theory. 44 of 81 people found this review helpful. This is the book my four year old uses for her lessons. The progression of notes is practical and the creative, original songs are enjoyable. The book's illustrations are beautiful and the technique is easy to follow and comprehensive. A great first book! 63 of 125 people found this review helpful.